HMS Talent and HMS Triumph will move to Her Majesty's Naval Base (HMNB) Clyde at Faslane, by 2020. 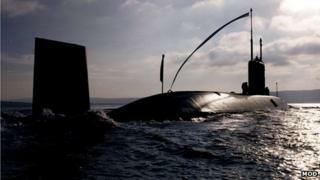 The MoD said this was another step towards HMNB Clyde becoming home to all of the UK's submarines. Defence Secretary Michael Fallon said: "This decision balances the Royal Navy's operational requirements with giving more clarity to our servicemen and women to plan their family lives. "HMS Torbay and HMS Trenchant crews and their families now have certainty that Devonport will be their home port until the boats decommission. "We expect that local communities will welcome HMS Talent and HMS Triumph and their crews and families when they arrive in Scotland later this decade." The Torbay will be decommissioned in 2017 and the Trenchant in 2019 with the Talent and the Triumph expected to be decommissioned in 2021 and 2022 respectively. The MoD said keeping the Torbay and the Trenchant in Devonport until they are decommissioned represented better value for money than moving them. The Trafalgar class submarines are nuclear-powered but conventionally armed. Commodore Graeme Little, naval base Commander at Devonport, said: "The decision for HMS Torbay and HMS Trenchant to remain in Devonport reflects the operational and support demands of the boats and minimises potential disruption and uncertainty to our submariners." The 5,200 tonne Trafalgar class submarines are being replaced by the 7,800-tonne Astute class with seven scheduled to be built.